You might have noticed my posts on social media about joining my mailing list for my author newsletter, Inspired by My LDS Life. Wondering why you might want to do that? Here's a few details about what to expect if you sign up for my newsletter. 1. Are you looking for FHE lessons, girls camp crafts, young women activities, or cub scout ideas? My newsletter will include ideas, suggestions, and tips. 2. Do you enjoy inspiring stories? The newsletter will include true short stories to re-motivate you and help you see the positive side of life. 3. You can be the first to get updates on my books and writing. This is one of the best ways to be sure not to miss important news like new releases, special promotions, book signing events, and other public appearances. 4. Free downloads. I'll be including free downloads occasionally, including FHE lessons, helpful print-outs, and extra scenes featuring characters in my LDS teen fiction. 5. Win free stuff. I'll be doing some giveaways that will be exclusive to my newsletter readers. 6. Want a good book recommendation? My newsletter will have some recommended reads. 7. You will also find links to my blog posts in case you missed them, along with previous blog posts that might be of interest. 8. I won't spam you or give out any of your personal information.You will receive an average of one newsletter a month. 9. Signing up for the newsletter is a double opt in process. That means you have to verify you really want to be a part of the mailing list by clicking a link in an email that is sent to your inbox. If you can't find the email after signing up, check your spam folder and then be sure to add me to your contacts. If you still have problems, please contact me and I'll help you out. 10. 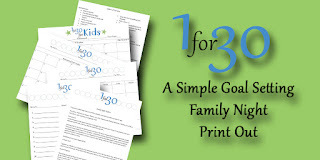 If you sign up before February 5th, you will receive a free download for my goal setting family night lesson, called 1 for 30. It's a simple goal setting plan with tracking sheets and a full family night plan. It can be adapted to any family size! That's the basic idea of the newsletter. You can sign up using the link below or the one in the left side bar of the blog.